17th day of the year with 348 days to follow (349 in leap years). 1806 James Madison Randolph, the grandson of Thomas Jefferson, becomes the first child born in the White House. 1912 Sir Robert Falcon Scott reaches the South Pole, one month after Roald Amundsen. 1916 The Professional Golfers Association (PGA) is formed. 1917 The United States pays Denmark $25 million for the Virgin Islands. 1929 Popeye the Sailor Man, a cartoon character created by Elzie Segar, first appears in the Thimble Theatre comic strip. 1982 “Cold Sunday” – in the United States temperatures fell to their lowest levels in over 100 years in numerous cities. 1989 Stockton massacre: Patrick Purdy opens fire with an assault rifle at the Cleveland Elementary School playground, killing five children and wounding 29 others and one teacher before taking his own life. 2001 President Bill Clinton posthumously raises Meriwether Lewis’ rank from Lieutenant to Captain. 2007 Doomsday Clock is set to five minutes to midnight in response to N. Korea nuclear testing. Murphy applied for a post at a famous Irish firm based in Dublin. An American applied for the same job and since both applicants had similar qualifications, they were asked to take a test by the Manager. When the results were in, amazingly, both men had only one wrong answer. ~ Rock is dead. Long live paper and scissors. ~ The last thing I want to do is hurt you. But it’s still on the list. ~ In America, anyone can be president. That’s one of the risks you take. ~ Life would be easier if I had the source code. ~ There are 10 types of people in the world. Those who understand binary, and those who don’t. ~ I think, therefore I’m dangerous. ~ Time is nature’s way of keeping everything from happening all at once. ~ If you’re not part of the solution, you’re part of the precipitate. ~ Actions speak louder than bumper-stickers. ~ Under Capitalism, man exploits man. Under Socialism it’s the other way around. “What happened to this patient?” he asked in astonishment. “He fell out of a tree,” I reported. 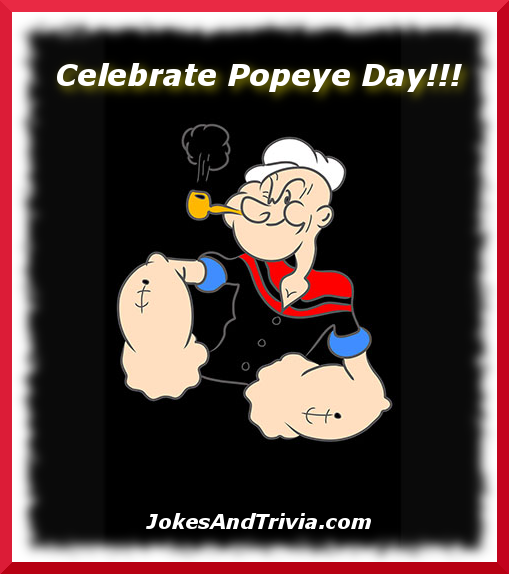 pic of the day: Celebrate Popeye Day! It was a mystery that could only be solved by the great Sherlock Holmes himself. The day after every full moon, members of a Japanese fraternity would be found dead in the hall on the fourth floor. The victims were crushed and there were signs of skid marks and tire tracks on the floor. Holmes was called into the case. It quickly became apparent that the only student that was not frightened was a young man named Nagawa who quickly became the object of Holmes’s suspicion. The evening of the next full moon, while peering through the keyhole of Nagawa’s room, they saw that the student was no longer there, and in his place was a classic Japanese compact car!!! “But how did you know that?” gasped Nagawa. At this, Nagawa panicked, and ran down the corridor. As he opened the door to escape, he turned into a car again, but as he expanded he became trapped in the doorway. The pressure was so great that he exploded. No trace of him was ever found. But for several days it rained Datsun cogs. SAFER: I hope you didn’t over-do it today. ULTRA SAFE: Here, have some more chocolate. A minister and lawyer were chatting at a party. “What do you do if you make a mistake on a case?” the minister asked. The Reverend Douglas Johnston was not the best of drivers. One Sunday he was driving home from church when unfortunately, he had a minor bump with cyclist. The poor man was knocked off his bike into the ditch. The Vicar naturally stopped his car, got out and profusely apologized and gave the cyclist his calling card saying that if he could ever be of help, then the man should not hesitate to ask. The New York Times, among other papers, recently published a new Hubble photograph of distant galaxies colliding. Of course, astronomers have had pictures of colliding galaxies for quite some time now, but with the vastly improved resolution provided by the Hubble Space Telescope, you can actually see the lawyers rushing to the scene. TODAY IN TRIVIA: How old was Mr. Ed when he died? Television horse Mr. Ed was foaled in 1949 in El Monte, California. Mr. Ed’s original name was Bamboo Harvester. Raised as a parade and show horse, he was once owned by the president of the California Palomino Society. He died in Tahlequah, Oklahoma, on February 28, 1979, at 30 years old. ~ How often do wolves attack people? Despite man’s fear and hatred of the wolf, it has not ever been proved that a non-rabid wolf ever attacked a human. ~ When was Popeye’s first film appearance? Popeye’s first appearance on film was in a 1933 Betty Boop Paramount cartoon called Popeye the Sailor. ~ Where does Popeye get his strength? He’s strong to the finish cause he eats his spinach! Spinach not only gave Popeye superhuman strength, but also endowed the sailor with abilities like virtuoso dancing or playing piano. The Popeye cartoons were so popular during the Depression, sales of spinach in America increased by 33%, and it briefly slotted in as the third most popular kids food after ice cream and turkey. “Popeye” spinach is still the second largest-selling brand of spinach in America.